Hi guys! I moved my “life” to Miscellany (another WordPress blog). I decided to incorporate my food, travel, fitness, ramblings and random shorts into one blog. Meanwhile, I left my poledancing blog and crafts blog as is. See you in a jiff! It was always about the pork buns which was precisely why I wasn’t in a rush to sample it. I wasn’t too keen on falling in line especially if it’s for food. What marshmallow?! Then there was Rocky. My best friend’s opinion on everything matters because he hasn’t quite disappointed me yet with his reviews and recommendations. What he said was Tim Ho Wan is one of the cheapest restaurants with awarded with a Michelin star and doesn’t it make me curious. It was that simple and I knew I had to try it. We finally got to try after several times of not even considering the line. My verdict is a harsh no. Don’t get me wrong. I did like it but was it worth the wait? No. The pork dumpling is more than alright. The ingredients were fresh that even the chopped chili on pork ribs was crisp and flavorful. They were quite generous too in terms of not using extenders. Good yes, but will I rave about it? No. There were certainly no fireworks there. My brother who is into pork buns said it was good but even that lacked enthusiasm you have when you are fed with glorious food. You’re supposed to close your eyes. You’re supposed to drool over the thought of it even if you just had it. You’re supposed to bang your hands on the table and cuss like a barbarian after tasting something really good. That is what I think was missing. Maybe they are consistent which is what many people look for in a restaurant but I’m sorry far from magical. What to buy in Baguio: Food! 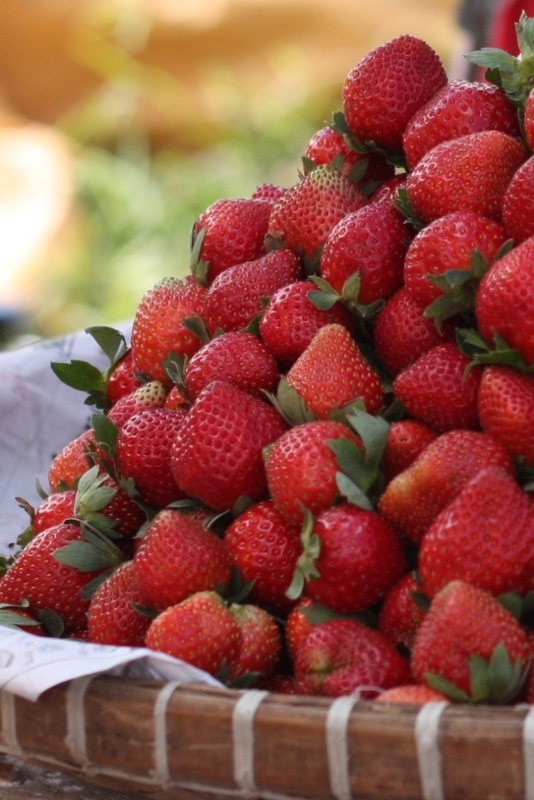 strawberry – As I’ve said strawberry is synonymous to Baguio. You just have to eat some and save a lot as people back home will surely ask for it. Its life is short so make sure you get to distribute it to your friends soon. strawberry wine – Make sure you choose ones that are securely sealed so you won’t make a mess in transporting them. They make perfect pasalubong or gifts for specially occasions. strawberry jam – I’m also not big on jams and preserves but others are crazy about them. They’re perfect with butter and cheese on toast plus it’s not everyday in Manila you get jams with real strawberries. chocolate flakes – This was not available when I was young and I don’t understand its relevance to Baguio but since it is good and addicting, it also became a staple Baguio pasalubong. I only know of the brand Mikasan. ube – This gets easily spoiled but it’s alright because people also can’t get enough of it. broccoli – The price difference still varies depending on the season but it can be as much as 5 times more expensive in Manila. This means only one thing: hoard as much as you can. Why limit yourself? While your at it get cauliflower, asparagus, lettuce, beans, tomatoes and other fresh vegetables that are good for you. sundot kulangot – I actually don’t like this but I have to put it on my list because it’s perfect for kids simply because you have to eat it with your finger. It is an essential Baguio pasalubong. bread – I hear a lot of good things about bakeshops in Baguio and I think it’s simply because of supply and demand. Naturally, people like their bread fresh and warm as it is cold so bakeshops do it right. Plus the fact that certain fruits only grow in Baguio, baked goods are not only one of a kind, they’re also fresher and cheaper than ones sold in Manila. strawberry ice cream – the fresh strawberry ice cream sold in La Trinidad is being sold by the gallon. If you can find a way to transport it back to Manila with some dry ice and cooler magic a lot of people will love you for it. Yes, including me! 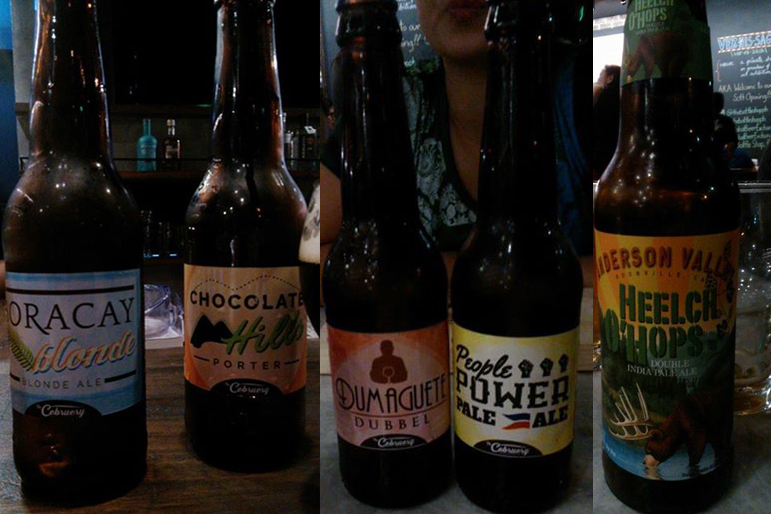 craft beer – This isn’t really anything Baguio is known for but since there are few breweries in the whole of the Philippines, Baguio Craft Brewery is worth a visit. Bring home craft beers to share with your friends and why not down a bottle or two while you’re there. I worked on a list of non-edible pasalubong from Baguio too so check it out soon. Strawberries are synonymous to Baguio and up until our recent trip I didn’t want to try anything other than the fresh ones. Who can blame me after years of artificially-flavored, overly sweet and sticky red syrup that you can easily associate with medicine? But I figured this kind of thinking won’t get me anywhere so I have to try even in smaller bites. strawberry yogurt shake – This one was from Cafe Sabel’s inside Ben Cab Museum. With sweet and sour tones, it was really refreshing after a stroll. It wasn’t too thick but it didn’t seem like it was watered down or anything like that. strawberry ice cream – I was shaking my head when I saw people lining up for ice cream at La Trinidad. But that was before I saw how fresh the ice cream was. It was red from all the strawberry bits. I think the sun was also partly to blame but me having two servings was just crazy since I’m not big on ice cream often. I was told you can order a gallon! strawberry taho – My nephews and nieces were all going gaga over taho in rich strawberry syrup with bits so I said I had to try even if I was almost sure I was going to regret it. It turned out to be a pleasurable experience but I did ask the taho vendor to go easy on the syrup. I did not dare taste the strawberry wine but I heard good things from my relatives. It’s perfect for pasalubong if you want something more than the usual jam or preserves. Just remember that the foil-covered ones aren’t sealed completely so you have to be mindful of packing. I enjoyed Xavierbeer’s Strawberry beer in Manila but unfortunately I didn’t have time to visit Baguio Craft Brewery for another helping. The slice of strawberry shortcake we tried tasted like Rebisco filling icing so I won’t include that here. But anyway I think you should go and try every kind of pastry with strawberries while you are in Baguio because chances are they’re fresh, right? I heard about strawberry rice too but the resto referred to us was closed. Lastly, I don’t think you can ever go wrong with getting a basket of fresh, red, juicy ones if you are still undecided. Bake and have fun with it. Serve it over pancakes or waffles. Use it in salads. Make it into smoothies. 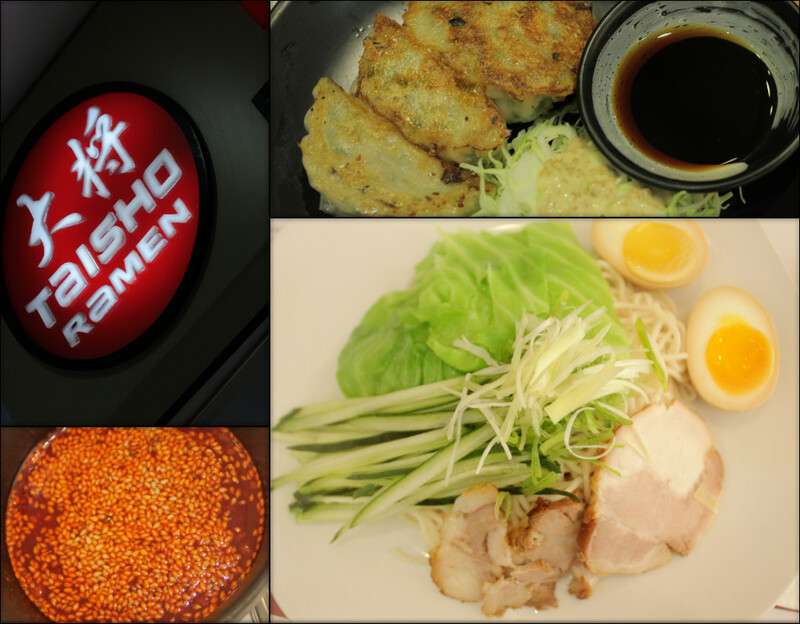 Taisho Ramen and Teppanyaki House – Broth! I’m not a fan of ramen or any kind of noodle dishes for that matter so even if I did plan to write about ramen restos since the dawn of the craze, I never felt up for it until the fifth one I visited. I’ve visited Kenji Tei (3rd floor Greenbelt 5), Ramen X (Centris) and Kichitora Tokyo (2nd floor Atrium Mega Mall) Moshi Koshi Noodle Boss (4th floor, Robinson’s Galleria) and finally, Taisho Ramen and Teppanyaki House (Sky Garden The Block side, SM North). I could of course be comparing food joints that are worlds apart and I wouldn’t really know which one’s authentic and all but I liked Taisho best. It is expensive yes and the portions won’t exactly make you feel like a kid on your birthday. I mean I’ve tried one with roughly the same price range that has pork slices twice the thickness of what I was served but what can I do if it’s the one I liked best. Its broth is thick, tasty and yet it was simple. It was rich yet it’s the least salty among the five. I was back the next day trying out two more after the first bowl I tried. It was weird. The deed was certainly a selfish and satisfying one. The place is nothing fancy but are you really there for all the glitz? They’re celebrating their first anniversary by slashing 50% off their ramen from September 8-10 2014. We’ll see if I can spoil myself a bit more with this very tempting discount Taisho Ramen and Teppanyaki House is offering. We are in luck as we have two more days to exhaust it! See you there?